This unique synthetic wax was formulated for cleaning your brushes, tools, and even your palette between encaustic color changes. 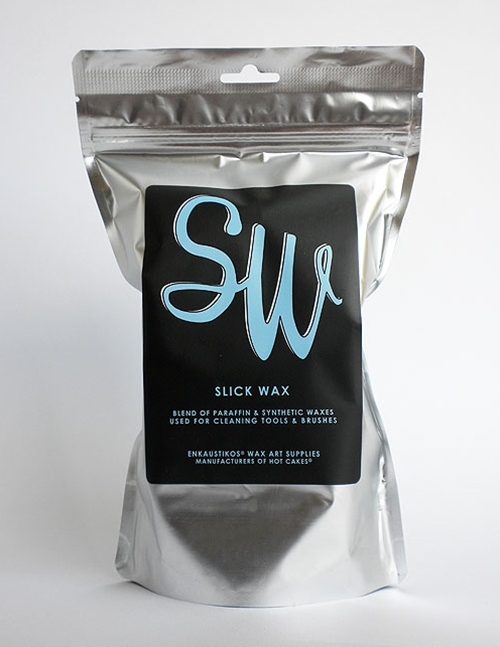 We named it Slick Wax because it really works like a charm! 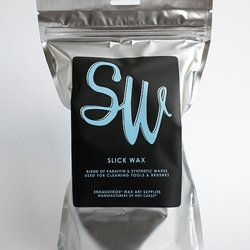 Slick wax eliminates the need for any type of solvent in your studio. Simply have a tin of melted slick wax available on your hot palette during the entire painting process and you will be able to avoid color contamination. When you want to move from one color to another, simply rinse your brush in the slick wax and wipe off any excess wax with a paper towel. The slick wax will have removed the color with ease and you can get right back to painting. And for those who like to color mix on their palette, you can even use the slick wax directly on the palette and with a wipe of a paper towel, you will have a nice clean surface to continue color mixing on. Many encaustic artists can agree that this product is truly essential to any encaustic studio! If you use it a lot, we recommend you pick up our larger sizing available within our sundries line. It comes in our resealable silver bag for easy storage. For those looking for the metal Hot Cakes tin, Slick Wax is available in 6 fl oz as well!